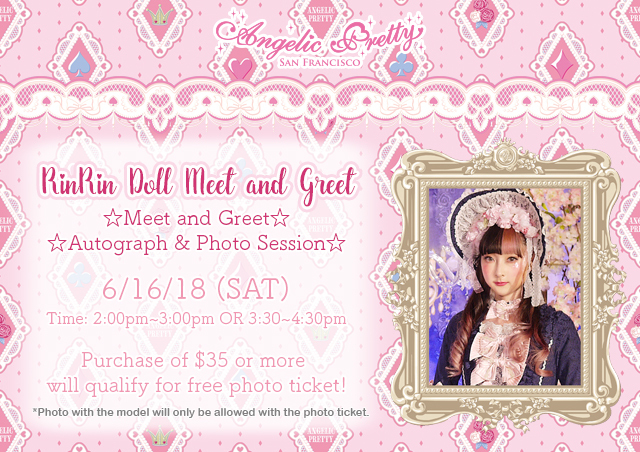 Make a purchase over $35 and receive a ticket for photo and autograph session!! You will also receive a special message card with RinRin Doll’s autograph. Purchase can be made from 5/15/18~ instore or online www.angelicpretty-usa.com/shopping. You can choose from 2 time slot, 2:00pm~3:00pm OR 3:30pm~4:30pm for the photo/autograph session.